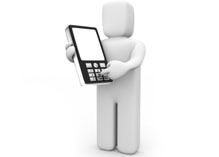 Convergence and integration are the new mantras in the field of mobile technology. With technologies pacing towards them, soon you will find all the applications converging into a single multi purpose device whereby your mobile phones can be used to check current stock prices or even be connected to a remotely placed system. At Valley Web Solutions our expertise lies in developing customised solutions for a wide range of wireless and mobile technologies including the following Operating Systems: Pocket PC, Tablet PC and the Palm. We develop solutions using .NET framework and the J2ME framework that allow for rapid deployment and sophisticated user functionality. We adopt industry qualified Project Management Process for every project. Our expert analysts first study your requirements to come up with a proposed solution to solve all your requirements with a user-friendly approach. On getting your consent, our qualified and experienced developers use their technical competencies to develop quality mobile application within a timeframe and specified budget. Valley Web Solutions provides you proven tools for rapid mobile application development of commercial-grade wireless applications, and allow you to develop applications that are platform, device and OS independent. We understand and help you accomplish your business goals, wherever you are. At our offshore development center we work with a skill base of both mainstream application as well as the handheld device application for the following Operating Systems: Pocket PC, Tablet PC and the Palm. We develop solutions using .NET framework and the J2ME framework that allow for rapid deployment and sophisticated user functionality.